Incumbent Bruce Poliquin makes a point while answering a question from a local resident in the 2016 Congressional debate between himself and Challenger Emily Cain held at WAGM Television Station in Presque Isle. 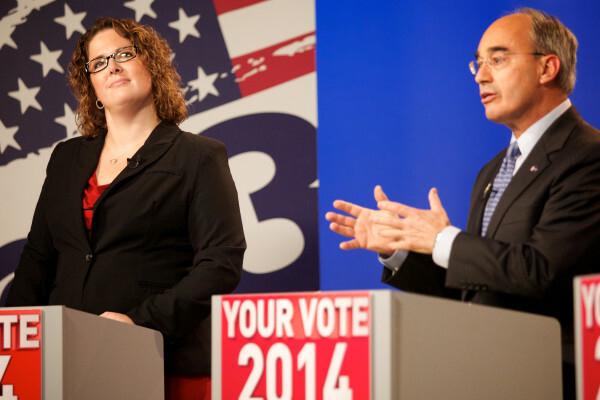 Democrat Emily Cain (left) and U.S. Rep. Bruce Poliquin, a Republican, during a 2014 debate in their first race to represent the Second Congressional District. 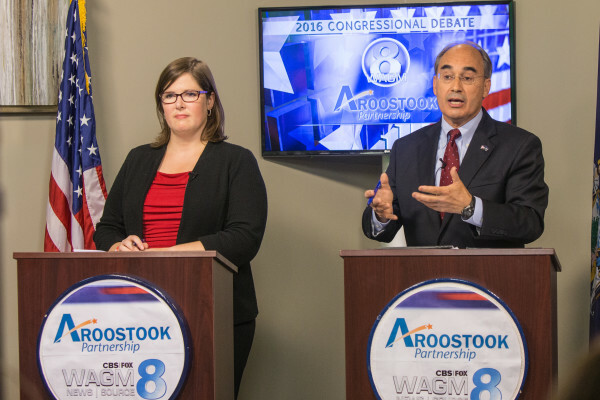 PRESQUE ISLE, Maine — Concerns about a stagnant job market and rising taxes in Aroostook County took center stage in the second debate between incumbent 2nd District U.S. Rep. Bruce Poliquin and challenger Emily Cain. Poliquin, a first-term incumbent Republican seeking re-election, and Cain, a Democrat, went back on forth for an hour answering questions submitted by Aroostook County residents in a debate hosted by WAGM-TV in Presque Isle. The candidates discussed issues ranging from preserving Social Security and Medicare to addressing climate change, national security and the opiate crisis. They also spent time criticizing each other — as has been frequent in this rematch that has drawn nearly $11 million in political advertising from outside groups. Poliquin defended his background in business and his voting record and advocacy in areas such as pressuring the Department of Defense to source athletic training shoes from New Balance, which employs 900 people in central Maine. Poliquin argued that energy costs and taxes are the two biggest factors holding back rural Maine’s economy. “The cost of energy has to go down, and taxes need to go lower,” he said, adding that he supports repealing the estate tax. The debate also featured multiple exchanges where the candidates questioned the other’s record and intentions. Cain argued that Poliquin, a former financial manager, is backed by Wall Street interests and has taken a position against the Trans Pacific Partnership trade deal only after it became politically practical. Wednesday’s debate was the second of three scheduled between Cain and Poliquin. The first was broadcast Tuesday on Maine Public. The last is set for Oct. 26 on WCSH and WLBZ, the NBC affiliates in Portland and Bangor.